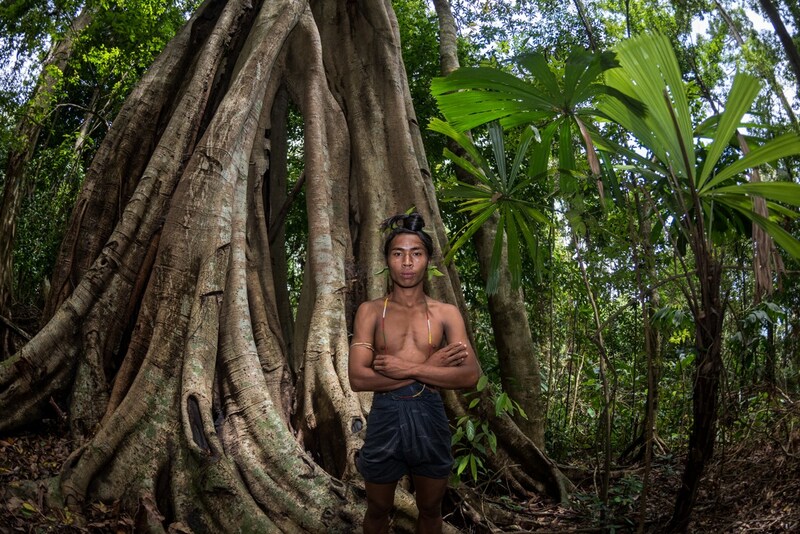 A team of indigenous parabiologists in Bangladesh’s Chittagong Hill Tracts, documenting their forest’s wildlife, have uncovered a surprisingly wide range of species. The parabiologists belong to the Mro ethnic group and work with the Creative Conservation Alliance co-founded by Shahriar Caesar Rahman and colleagues. 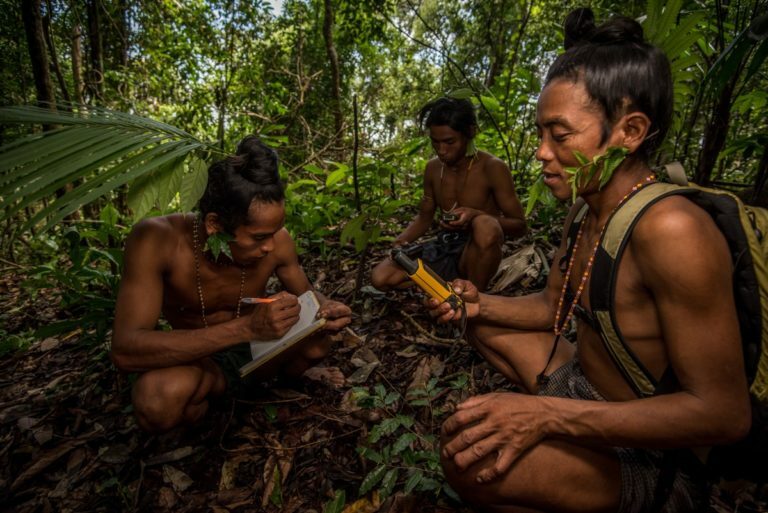 They set up camera traps, monitor hunting and consumption of turtles and other wild animals in villages; act as protectors of hornbill nests; and serve as community leaders. The Mro parabiologists have become so crucial to the researchers’ work that they are regularly listed as formal co-authors of scientific papers. 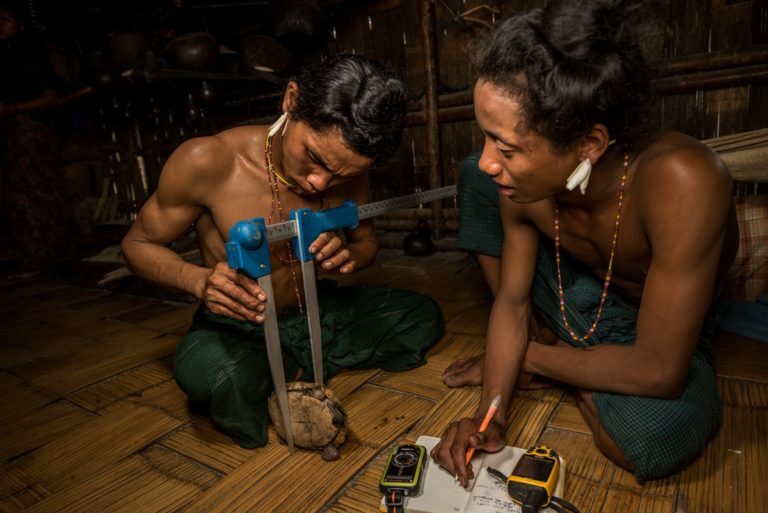 Mro parabiologists in Bangladesh have been critical to documenting the Hills’ biodiversity. Image credit: Scott Trageser Photography/Creative Conservation Alliance. 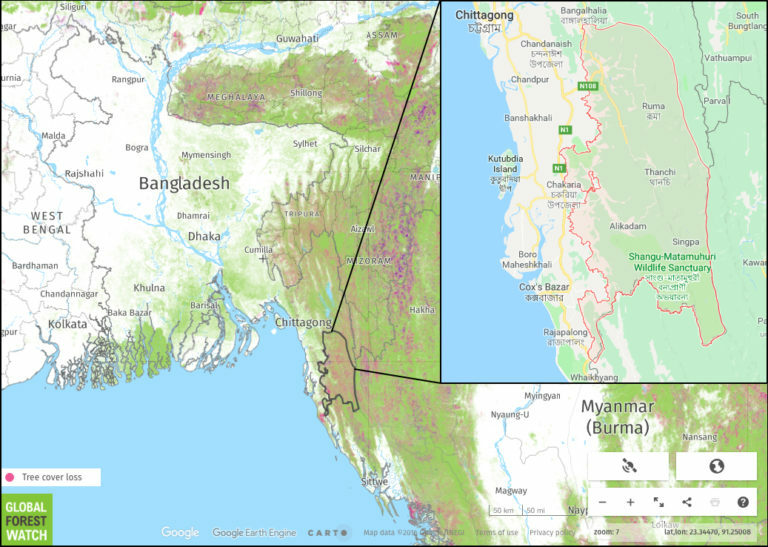 The Mro people live in the Bandarban district of Bangladesh (outlined in red in the inset map). Map by Shreya Dasgupta/Global Forest Watch/Google Maps. 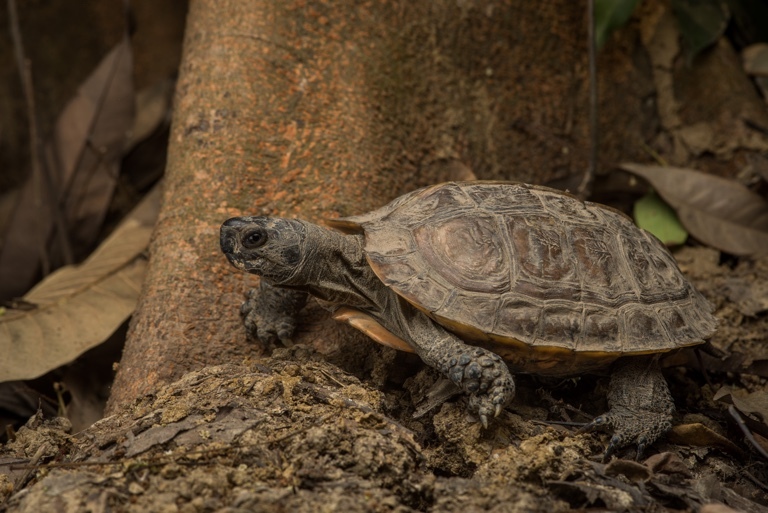 Arakan forest turtle. Image credit: Scott Trageser Photography/Creative Conservation Alliance. 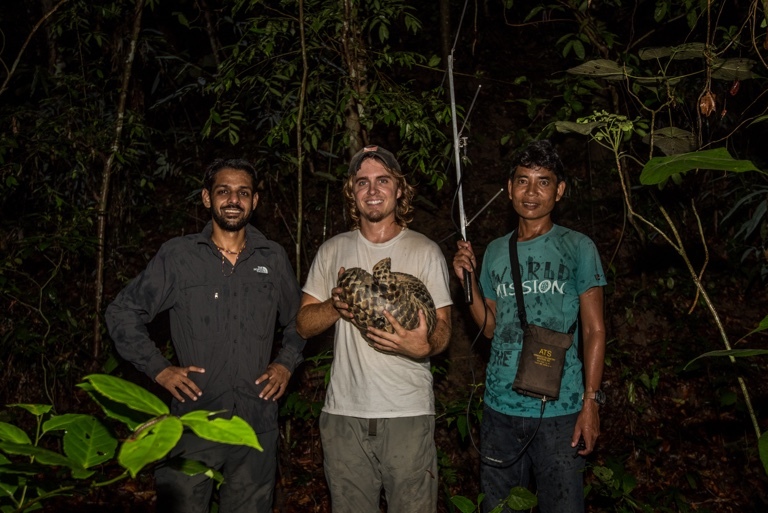 Mro parabiologists monitor and rescue turtles from villages, and release them back to the forest. Image credit: Scott Trageser Photography/Creative Conservation Alliance. 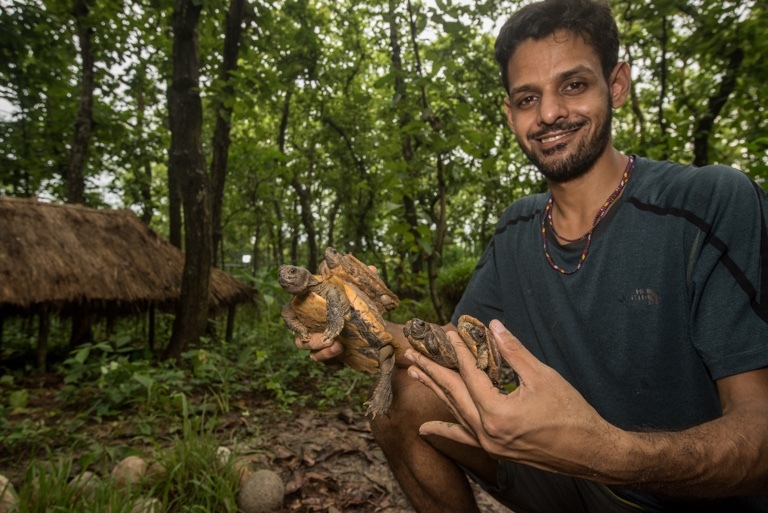 Shahriah Caesar Rahman with Arakan forest turtles in breeding center. Image credit: Scott Trageser Photography/Creative Conservation Alliance. Both CCA researchers and Mro parabiologists co-author scientific papers. Image credit: Scott Trageser Photography/Creative Conservation Alliance. 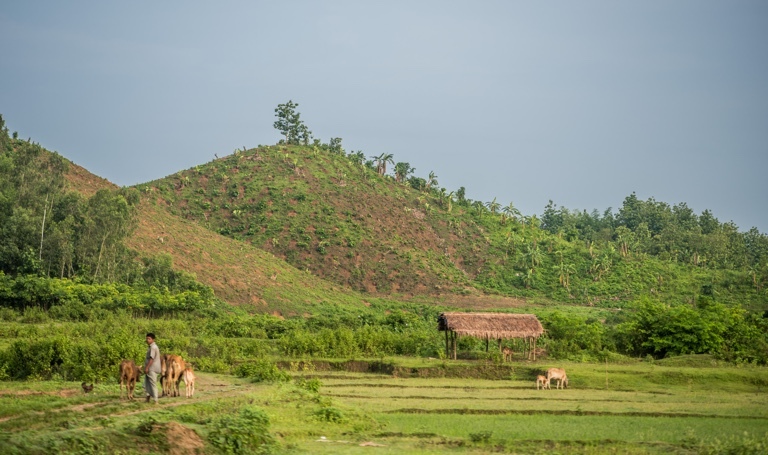 Hills in the Chittagong Hill Tracts lay bare from unsustainable logging and agricultural practices. Image credit: Scott Trageser Photography/Creative Conservation Alliance. Mro parabiologists set up camera traps, collect GPS data, take measurements of animals, and conduct social surveys. Image credit: Scott Trageser Photography/Creative Conservation Alliance.